Last night Hippie Chick, Globe-Girl, /B/ & I all went to a Taize service. 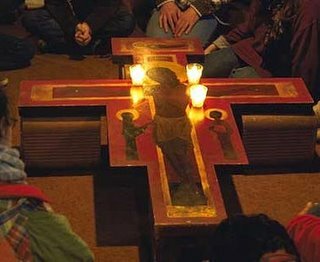 If you've not heard of Taize, it is a simple service made up of repetitive prayers set to simple music, and some scripture reading. The purpose of this contemplative service is to provide an opportunity for quiet reflection and then have an encounter at the cross. There is a large wooden cross (in a unique shape) which is laid out on the floor in the center of the room. One can kneel next to it, and most lean forward with their head on it, praying as they do so. It is quite a powerful experience. Some Taize services are very small. The one we participated in was quite large -- I would guess there were around 200-250 people there. You can beseech of the googley to find a service near you, but in our area it is held at The Mercy Center in Burlingame on the first Friday evening of the month, from 8:00 pm -- 9:30 pm or so. For now we see indistinctly, as in a mirror, but then face to face; now I know in part, but then I shall know fully just as I also have been fully known. I'm getting to know Globe-Girl and /B/ more and more. I'm also allowing them to know me more and more. I like to think I know myself pretty well. I know Hippie Chick pretty well. Hippie Chick knows me pretty well. But no one on this planet knows me as deeply and as completely as God knows me. This verse says when I am face to face with Him when the end comes, I will be allowed and invited in to know Him as deeply and as completely as He now knows me. Whoa! A total mind mending and heart melting invitation, and I look forward with eager anticipation for that encounter! Bless the Lord, my soul and bless God's holy name. Bless the Lord, my soul. God leads me into life. Psalm, reading (1 Cor 13) and silence of about 5 minutes. The glance of God embraces me. The gaze of God enfolds me. The grace of God transforms me from within. Salvator mundi, salva nos. Salvator mundi, salva nos. Salva nos. Salva nos. Salvator mundi, salva nos. O Lord hear my prayer, O Lord hear my prayer. When I call, answer me...come and listen to me. Come and fill our hearts with your peace. You alone, O Lord are holy. Come and fill our hearts with your peace. Praise to the Living God. Ubi caritas et amore. Ubi caritas, Deus ubi est. Peace, peace, peace unto us. Peace, peace, peace on earth. Jesus remember me when you come into your kingdom. With you, O Lord is life in all its fullness and in your light, we shall see true lighht. Great peace they surely have who inour God confide, who cast on God all care, and in God's love abide.